The Ras GTPase superfamily, which includes Ras, Rho, Rab, Arf, and Ran subfamilies (among others), has been shown to regulate a wide spectrum of cellular functions. GTPases function as molecular switches, cycling between an inactive GDP-bound form and an active GTP-bound form. The Rho GTPase subfamily includes Rho, Rac, and CDC42, and is believed to be involved primarily in the regulation of cytoskeletal organization in response to extracellular growth factors. However, recent research has shown that they also play crucial roles in diverse cellular events such as membrane trafficking, transcriptional regulation, cell growth control, and development1. The efficiency of GTPase-mediated signal transduction depends on the ratio of active to inactive GTPase. The amount of active GTPase can be altered in several ways: (1) Promotion of GDP dissociation by guanine nucleotide exchange factors (GEFs) which facilitates activation by GTP binding; (2) Inhibition of GDP dissociation by guanine nucleotide dissociation inhibitors (GDIs); (3) acceleration of hydrolysis of GTP to GDP by GTPase-activating proteins (GAPs), thereby reducing the amount of active GTPase1 (Fig. 1). In addition, modifications such as tyrosine phosphorylation are important in both upstream and downstream Rho GTPase signaling pathways. Here, we discuss the roles of tyrosine phosphorylation in regulating Rho subfamily GTPase activity. Rho GTPase activation is tightly regulated by Rho GEFs. Tyrosine phosphorylation directly activates RhoGEF (Vav and Dbl) activity. Both the Vav and Dbl family of GEFs contain a Rho GTPase binding site composed of the Dbl homology (DH) and Pleckstrin Homology (PH) domains. In an inactive state, they form a closed structure that hinders access of Rho GTPases to the DH-PH binding domain. Upon stimulation (e.g., epidermal growth factor [EGF]), sequential phosphorylation on multiple tyrosine residues (and possibly serine/threonine residues) causes a structural relaxation of this auto-inhibited state, allowing the binding of Rho GTPases to the catalytic sites and stimulating nucleotide exchange from GDP to GTP on the substrates2-4. Localization of Rho GTPase to the plasma membrane is required for its activation by membrane –associated GEFs and association with effector proteins. RhoGDI plays an important role in regulating cytosol-membrane cycling of the Rho GTPases. RhoGDI forms complexes with Rho GTPases in the cytosol and prevents them from localizing to the plasma membrane where they are activated (Fig. 1). In cells expressing constitutively-active Src non-receptor tyrosine kinase, RhoDGI is phosphorylated at Tyr-156, which causes a dramatic decrease in its ability to complex with the Rho GTPase, resulting in localization of the Rho GTPase to the membrane where it can be activated and exert its function. After deactivation of the Rho GTPase by hydrolysis of GTP, RhoGDI can presumably reassociate with the inactive Rho GTPase and mediate the recycling of the Rho GTPase to the cytosol5. Figure 1. Tyrosine phosphorylation plays important roles in regulating Rho family GTPase activation and binding partners. 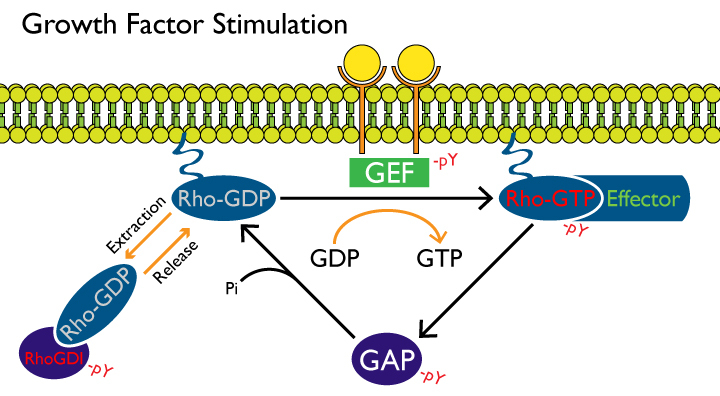 To maintain homeostasis in GTPase signaling, Rho GAP accelerates the hydrolysis of GTP, thereby converting active Rho GTPases to an inactive GDP-bound state. Tyrosine phosphorylation can have both positive and negative effects on Rho GAP activity. A study by Sordella et al.6 indicates that phosphorylation of p190-B RhoGAP by insulin-like growth factor 1 (IGF-1) at Tyr-306 in mouse embryonic fibroblasts (MEFs) does not directly affect its GAP activity. Instead, it causes a rapid redistribution of p190-B RhoGAP to the plasma membrane (lipid rafts) where it can act upon active Rho localized there6. Another study by Kai et al.7 has shown that EGF-stimulated, Src family kinase-mediated phosphorylation of b2-chimarein (a Rac-specific GAP) at Tyr-21 negatively regulates its GAP activity, possibly by promoting the association with a regulatory protein or by inducing steric inhibition between the Rac binding domain of the Rac GAP and active Rac (Pro-23 and Pro-24), thereby reducing its ability to deactivate Rac via GTP hydrolysis7. Several studies also indicate that direct tyrosine phosphorylation of Rho GTPases regulates their intrinsic localization, activation, and binding partners. EGF stimulates the phosphorylation and Vav2-mediated activation of Cdc42. EGF-mediated phosphorylation of Tyr-64 on Cdc42 is mediated by Src tyrosine kinase and enhances the binding of active Cdc42 to RhoGDI. Interestingly, Cdc42 phosphorylation is not required for Cdc42 activation or interaction with effectors. Binding to RhoGDI facilitates the release of active Cdc42 from the membrane and its movement between different cellular locations where it can associate with different targets/effectors to potentially regulate important cellular transformation events8. Rac1 is also phosphorylated at Tyr-64 by Src and FAK in vitro. Overexpression of Rac1-Y64D (a phosphomimetic construct) suggests that phosphorylation at Tyr-64 on Rac1 negatively regulates cell spreading, focal adhesion localization, and its binding to GTP, RhoGDI, GEFs, and its effector protein PAK9. A study of the atypical Rho family GTPase Wrch-1/RhoU indicates that Src-mediated phosphorylation of Tyr-254 in the C-terminal membrane targeting domain causes the relocalization of Wrch-1 from the plasma membrane to cytosolic internal membranes through altered GTP/GDP binding, thereby reducing its ability to recruit and activate its effector protein PAK10. Rho GTPases are tightly regulated by Rho GEFs, Rho GAPs, and RhoGDI, allowing them to function as molecular switches for many important cellular events. In addition, post-translational modifications, such as ubiquitination, SUMOylation, phosphorylation, and acetylation of proteins in the Rho GTPase signaling cascade provide an effective fine-tuning mechanism for Rho GTPase function and localization. Cytoskeleton, Inc, has recently developed a line of Signal Seeker™ Pathway Tool kits to enable researchers to investigate how various modifications are regulating their proteins of interest. Our proprietary lysis buffer makes possible the enrichment of different post-translationally modified proteins from the same lysate sample, making it easy to use for the investigation of possible interactions of different modifications on target proteins. Jaffe A.B. and Hall A. 2005. Rho GTPases: biochemistry and biology. Annu. Rev. Cell Dev. Biol. 21, 247-269. Gupta M. et al. 2014. 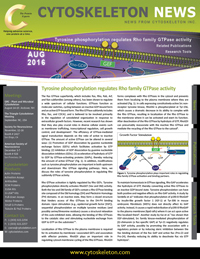 Tyrosine phosphorylation of Dbl regulates GTPase signaling. J. Biol. Chem. 289, 17195-17202. Patel M. et al. 2014. Phosphorylation-mediated regulation of GEFs for RhoA. Cell Adh. Migr. 8, 11-18. Bi F. et al. 2001. Autoinhibition mechanism of proto-Dbl. Mol. Cell. Biol. 21, 1463-1474. DerMardirossian C. et al. 2006. Phosphorylation of RhoGDI by Src regulates Rho GTPase binding and cytosol-membrane cycling. Mol. Biol. Cell. 17, 4760-4768. Sordella R. et al. 2003. Modulation of Rho GTPase signaling regulates a switch between adipogenesis and myogenesis. Cell. 113, 147-158. Kai M. et al. 2007. Tyrosine phosphorylation of beta2-chmaerin by Src-family kinase negatively regulates its Rac-specific GAP activity. Biochim. Biophys. Acta. 1773, 1407-1415. Tu S. et al. 2003. Epidermal growth factor-dependent regulation of Cdc42 is mediated by Src tyrosine kinase. J. Biol. Chem. 278, 49293-49300. Chang F. et al. 2011. Tyrosine phosphorylation of Rac1: A role in regulation of cell spreading. PLoS ONE. 6, e28587. Alan J. et al. 2010. Regulation of Rho family small GTPase Wrch-1/RhoU by C-terminal tyrosine phosphorylation requires Src. Mol. Cell. Biol. 30, 4324-4338.